The third of the seven churches to receive a letter from John. Pergamum was one of the greatest and most beautiful cities in Asia Minor. Under the Romans, it was the political capital of Asia, located 16 miles from the Aegean Sea opposite the island of Lesbos. Pergamum was a prosperous city with a glorious past. Pergamum was built on terraces on a precipitous mountain, 1165 feet above sea level.24 The terraces led up to the acropolis, which overlooked the broad Caicus River valley to the south. Small local boats sailed up and down the Caicus River to the sea. An important land route ran from Pergamum to the interior of Asia Minor, almost to the border of Asia. One of Pergamum’s kings, Eumenes II (197-159 B.C. ), was responsible for most of the building that took place in the 2nd century B.C. On the upper terrace of Pergamum, King Eumenes built government, military, educational, and religious buildings. These included the Doric Temple of Athena, the altar to Zeus, and a library that was second only to the one in Alexandria, Egypt. Altogether, Pergamum had no less than five palaces and five theaters. The arsenal of the acropolis contained an impressive store of catapult balls and could store enough grain to feed 1,000 men for a year. It was built about 200 B.C. The Altar to Zeus was built in the early part of the 2nd century B.C. After its discovery on the southern end of the upper city, its marble altar was taken to Berlin, reconstructed, and put on display in the Pergamum Museum. It was 112 feet by 118 feet. The reconstruction contains a frieze 365 feet long and 7.5 feet high, with nearly all its original 118 panels intact. The library of Pergamum, one of the greatest in the ancient world, had some 200,000 volumes. Mark Antony reportedly gave the entire library to Cleopatra, after which he moved it to Alexandria. Below the Temple of Athena, on the steep western slope, was an imposing theater that seated between 10,000 and 15,000 people. The theater was originally constructed about 170 B.C. In the middle city of Pergamum was a gymnasium, with an upper level for young men, a middle level for adolescent boys, and a lower level for children. 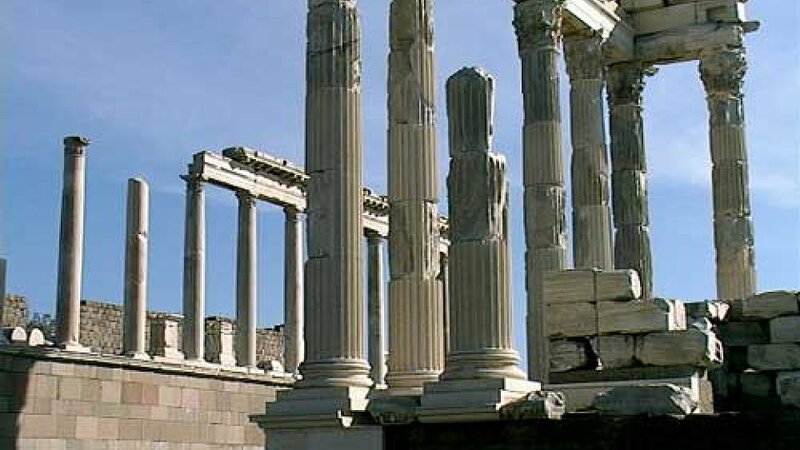 At the western end of the lower city was a 2700-foot Corinthian colonnaded street known as the “Sacred Way.” At the end of the street was the Asklepeion, or health center of Pergamum. It dates to Hellenistic times, but was important in Roman times, too. This shrine was built to the Greek god of healing, named Asklepios. The people who came here believed that Asklepios would heal them. The deities worshipped at Pergamum included Zeus, Athena, Asklepios, Dionysus, and Demeter. The last king of Pergamum, Attalus III, bequeathed the city to the Romans when he died in 133 B.C. Thus, Pergamum became the capital of the Roman province of Asia. The economy of Pergamum was based on the exportation of agricultural products, primarily wheat, and on parchment, mining silver, breeding stock, and making and exporting woolen textiles. The invention of animal skin parchment is attributed to Pergamum. Parchment was used in ancient scrolls instead of paper. Egypt, jealous over the rival library of Pergamum, stopped sending paper, necessitating the invention of parchment. Acts 19:10. The gospel probably reached Pergamum in the days of Paul’s third missionary journey. Rev. 1:11. Pergamum was one of the seven churches of Asia to receive a letter from John the Revelator. Rev. 2:13. Antipas is possibly the first Christian to be executed for his faith.